Many people have both MAC and PC these days, and while enjoying the benefit of the flexibility having both systems, it can be difficult trying to make them talk to each other. If you are one of those people, you probably have come across the problem of transferring file from Mac to PC, or the other way around. You might also find yourself keep trying to find the right mouse to use, switching your brain between “Command” and “Ctrl”, etc. I had the same problem, until I found this great tool that solved all these issues within a snap. The solution is a simple cable called Sanwa Supply KB-USB-Link3M. It’s a product from a Japanese Electronics Company named Sanwa Denshi, which is best known internationally as a leading manufacturer of arcade parts like joysticks. 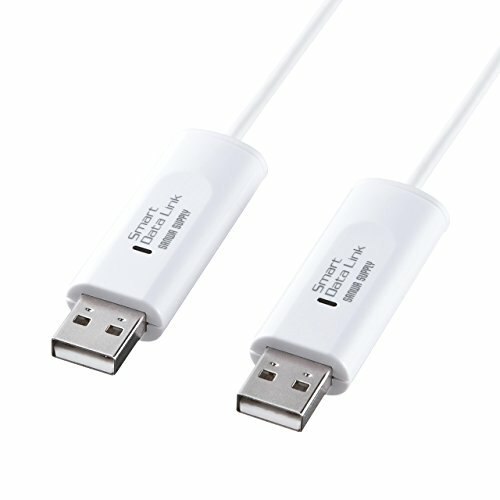 But you can easily get this cable on Amazon for 65 USD. I admit it looks a little pricy for such a small cable, but it does what others can’t, and I would say it definitely worth the money if you have the problem I have. The first thing this Sanwa Supply cable allows you to do is using the same set of mouse and keyboard on two connected machines. After you connect two devices via USB using the Sanwa Supply, you can simply move your mouse pointer from one display to another (Note that this is different from extending screen since here only the mouse pointer can move between displays). Machine relative position can be reconfigured to allow mouse to smoothly transition between each display (left and right, top and bottom, etc.). If you move the mouse to the other computer then the keyboard will work on that machine. The cable acts as a switch turning over control of the keyboard and mouse to other machine. With this feature, you will never be swinging your mouse wondering why it’s not moving till you realize you are grabbing the wrong one! The second great feature that comes with the magic switch cable is that you can drag and drop to copy files between Windows and OSX! This is the main feature of this product, and probably why it’s also called Sanwa Data Link. Again, just simply connect your Mac and PC, drag and drop files that are compatible to both systems, such as a picture, and it’s copied from your PC to Mac, or vice versa. Again this also works for transferring files between two computers of the same system. You can also check this short video below to see how it works. This is another feature that I absolutely love when I’m working on multiple devices. It’s a great complement to the two features above and makes working on multiple machine even easier. I guess it’s pretty much self-explanatory now how this works. Just have your two computers connected with the Sanwa Supply cable, and you can copy and paste text across the system just like you are on one. How cool is that. This is absolutely one of my favorite gadgets so far. It’s so simple and small, and it provides a spot on solution to a very common problem. I would highly recommend it to anyone have a Mac and a PC, or just frequently need to work on multiple devices.